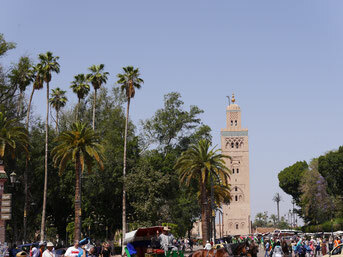 Pick-up from your accommodation in Marrakech will be early at about 8 am. 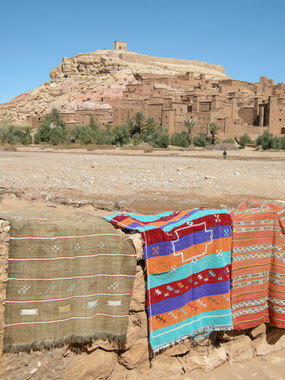 We will set off for our adventure in an air-conditioned 4X4 or minivan and head out to the High Atlas Mountains. At the amazing Tizi n'Tichka pass we will have a photo stop, but all along the way we will enjoy panoramic views and pass traditional Berber villages. 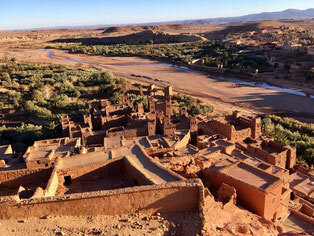 At lunch time we will arrive at Ait Benhaddou, the UNESCO World Heritage Site since 1987. There will be time to explore the fortified village (ksar), which is a great example of earthen clay architecture. Films like "Gladiator", "Marco Polo", "Son of God" and many more have been shot here. We will have a delicious local lunch (own cost) before we continue on to the citiy of Ouarzazate, where we spend the first night in a hotel on half-board. After breakfast we will drive through the lovely green oasis of Agdz and the Draa Valley to Zagora. We pass by Tamegroute, situated on the Draa River and well known for its glazed forest green potteries. In this small town we also will visit the once richtest library in North Africa with almost 50.000 volumes collected from all over the world. After this highlight we continue our way along the Draa valley to Tagounite. The night we will spend in a Kasbah Hotel with pool, on half-board. After having enjoyed breakfast, we leave the Kasbah and start our adventure into the peaceful and fascinating wilderness of the Sahara desert. Our 4X4 takes us along the sand dunes, sometimes passing by natural water sources, where we will serve your lunch. From a vast plateau you will get impressed by the huge sand dunes of Erg Chegaga, which is far away from civilization and the silence is overwhelming. 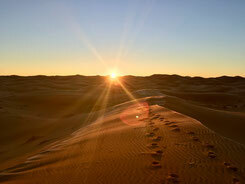 From the top of the dunes, you will be able to admire the most fascinating sunset. Tonight we will stay in a Berber camp on half-board and after dinner you can listen to the traditional berber/nomad folk music beneath the stars. 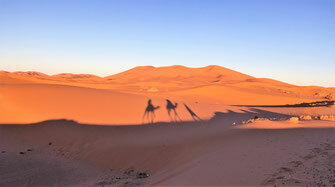 After breakfast we get ready for a special day to discover and enjoy the largest sand dunes of the Moroccan Sahara on a full day camel trek with picnic lunch in the shade. The average trekking time will be approx. 5 hours with breaks to relax, enjoy and have lunch. Return back to the camp for another night on half-board with tradtional music beneath the starry sky. Get up early and admire the last unforgettable sunrise in the middle of the desert and afterwards enjoy your breakfast either in the tent or open-air. After breakfast we will meet our driver and go to the village of Mhamid, especially to Oulad Driss, a Ksar which was built in the seventeenth century and first inhabited by Chrofas and Draouas tribes. After the guided visit to this ksar and the museum - and a mint tea - we drive back to the Kasbah hotel for lunch - and you can spend the rest of the day relaxing at the pool!! After breakfast we have to say good-bye to the Erg Chegaga and start the way back through the Draa valley to Marrakech, have lunch in a local restaurant en route (own cost) and will be back in the red city of Marrakech in the late evening. We will leave at about 8 am from your hotel in Marrakech. 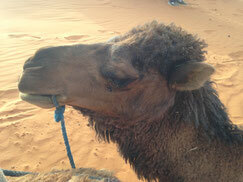 Dont't forget a backpack for your personal items for the night in the Sahara.